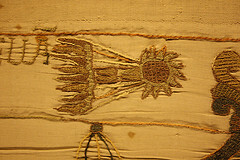 In 1705, Edmund Halley predicted the course and eventual return of his eponymous comet, and traced its past appearances (it is depicted in the Bayeux tapestry and was re-observed in 1758). Comets then were also called messengers, a vestige of their mythological role as messengers of the gods; Newton, Halley, and other astronomers of the day considered it possible that they existed to help supply the planets with water and other necessary materials. In last week’s episode of Cosmos, we saw how Halley’s fascination with comets led to his pressing Newton to finally publish his magnum opus, the three-volume set laying out his version of the calculus, the laws of motion, the law of universal gravitation, and his ability to use those tools to predict the paths of astronomical phenomena including comets (almost: The Principia came out in 1687, and it took another 18 years for Halley to account for the gravitational effects of the planets on comets’ orbits). The story behind those discoveries is rife with scientific intrigue and rivalries. Alas for Robert Hooke, one of the most brilliant scientists of his day, who advanced biology, physics, chemistry, optics, and a host of other sciences in ways that few others can claim. He was jealous to a fault, and lacked the mathematical skills to bring his intuitions about universal gravitation to fruition. He spent much of his time embroiled in disputes over priority of various discoveries, battling Huygens over clocks, and Isaac Newton over optics and gravity. Hooke may have stolen credit for some experiments that others asked him to conduct on their behalf. Newton outlived and outshone Hooke in the end, and some believe he destroyed the only known portrait of Hooke after his death. In this week's episode, I also learned that if you, like Robert Hooke, end up dying without getting an image of yourself preserved for future generations, a science show will turn you into an evil, balding hunchback to increase the drama of a history lesson. So take selfies forever, I guess. I also doubt that anyone ever told Hooke, “Put up or shut up.” Just saying. The leap from Halley and Newton’s predictions to the 20th century’s Jan Oort and the Oort cloud works nicely as a tale about the power of prediction, but I think there was a missed opportunity. Amidst all those men associated with comets, the history of science includes a famous and remarkable woman whose fame is tied to comets. A hundred years after Halley, Newton, and Hooke did battle, astronomers only knew of a handful of starry messengers, and French astronomer Charles Messier seems to have discovered most of them. Richard Holmes in The Age of Wonder (from whom most of this account is drawn) says only 30 were cataloged by the mid-18th century. Then came Caroline Herschel. In a short stretch, she discovered eight new comets— the first woman known to have discovered a comet at all, and the most discovered by a woman until the 1980s Her brother, William, had established himself as one of the great telescope-makers, and had used one of those devices to discover the first new planet since the days of ancient Greece. (He wanted to name it “the Georgian planet,” after the reigning King of England, but in time Uranus was the name that stuck.) His telescopes were so sensitive that he discovered that certain stars were not stars at all, but distant galaxies like our own, and his telescopes were the first that could resolve individual stars within those distant galaxies. “These clusters,” he wrote, “may be the Laboratories of the universe…wherein the most salutary remedies for the decay of the whole are prepared.” That is, he realized that new stars were being born in distant galaxies, that stars have lifespans and that galaxies too are born, and evolve. The idea inspired one of Erasmus Darwin’s evolutionary poems. Caroline Herschel became a celebrity. Even today, female astronomers are a rare breed, and in 1786, they were unheard of. But Herschel had indeed discovered a new comet, and it was, in the words of Fanny Burney (a novelist and lady-in-waiting to Queen Charlotte), “the first lady’s comet.” She discovered more comets, wrote the first updated English catalog of stars since Newton’s day, and aided in the construction of a massive 40-foot telescope (then the largest ever built). Touring the half-built structure, King George led the Archbishop of Canterbury through the tube, quipping, “Come, my Lord Bishop, I will show you the way to heaven.” Franz Joseph Haydn credited a visit to the Herschels’ observatory with his oratorio The Creation. In time, Caroline Herschel was given a royal stipend to continue her work (£50 per year, for life); she was the first woman in British history to be granted a royal salary to pursue scientific research (and possibly the first woman in the world hired to do science on the public dime). She was the first woman to receive the Gold Medal of the Astronomical Society of London (in 1828), and the last to receive one until Vera Rubin’s in 1996! The image on that medal: a bas relief of the Herschels’ 40-foot telescope. Caroline Herschel sacrificed a great deal for her work. She was pox-marked and stunted from childhood disease (a mere 4’3”) and her family had abandoned any hope of her marrying. She pursued a career in music, but at her brother’s request she gave it up to serve as his assistant and housekeeper. At one point, she claimed, “I did nothing for my brother but what a well-trained puppy dog would have done, that is to say, I did what he commanded me,” a judgment history certainly would dispute. In proposing that she receive a royal salary, her brother acknowledged that he’d have to pay twice as much to hire a male assistant. And yet she persevered, becoming one of the great scientists of her day, with her name attached to no fewer than 5 comets. Among her comets is the periodic comet 2P/Encke, the second periodic comet to have its return accurately predicted (after Halley’s, of course).